Launched in 2007, POTO:TYPE Design Competition set the stage for a critical reflection and an exploratory study of the high-rise, high-density residential typology of downtown Vancouver. The name “POTO:TYPE” is the union of the podium and tower type, and as such it is composed of a tall narrow tower atop of a roughly four-story high podium. The result is enhanced views as well as a closer relation to the street's scale. As can be found in Manhattan and Hong Kong, this skyscraper typology, developed in the 1990s, has become part of the metropolitan identity of Vancouver. In the design competition brief, however, the uniform expansion of this monofunctional typology on ever-growing urban territories is perceived as an environmental, socioeconomic and cultural problem. Due to real estate pressure, this typology of buildings is endangering the urban identity of Vancouver's various neighbourhoods by creating a banalized cityscape. Thus, alternative solutions to the podium/tower type must be studied in order to promote the sustainable development of the city, more specifically in the respect of urban diversity. POTO:TYPE Design Competition was organized at a critical time in Vancouver's politics regarding urban planning. It was initially organized by a group of architectural interns and then sponsored by many cultural and professional organizations that hold the promotion of architectural excellence at heart, such as the Architectural Foundation of British Columbia, the Architectural Institute of British Columbia, the Royal Architectural Institute of Canada, the Canada Council for the Arts, the Canadian Centre for Architecture, and last but not least the School of Architecture and Landscape Architecture of University of British Columbia. In 2006, Vancouver hosted the World Urban Forum, event organized under the aegis of the United Nations. It was a particularly symbolic event for the city; commemorating the first ever World Urban Forum. Launched 40 years before in the same city in response to the exemplary positions Vancouver had taken regarding environmental issues. Newly elected Mayor Sam Sullivan took this opportunity to collaborate with environmentalist and community activist groups in order to launch the Eco Density program. This program was established to highlight of the importance of densification in Vancouver, as basis for a sustainable development approach that would also respect its environmental diversities. Brent Toderian, new Director of Planning of the City of Vancouver, was in charge of Eco Density program and was also involved in POTO:TYPE Design Competition as a member of the jury. The jury was composed of many committed professionals and institutional officials that were highly aware of the issues concerning architectural modernity and cultural specificity in Canada. Leading figures such as James Cheng, Patricia Patkau and George Yu sat on the board, along with Rhodri Windsor-Liscombe, an architectural historian and Director of the Art History, Visual Art and Theory Department of University of British Columbia, a renowned specialist of Vancouver's modern architecture. Architect Scott Kemp acted as professional advisor during the process. James Cheng's presence on the jury is particularly significant, for he is considered as the principal instigator of podium/tower typology. The extent of his architectural practice and the impact of “poto type” on urban regulations are in part responsible for the particular quality of Vancouver's urban landscape. However, as pointed out by Trevor Boddy, James Cheng is also one of the first to have promoted the development of new solutions in order to renew, enhance and diversify residential architecture in Vancouver. Forty-five proposals from six different countries were submitted for the POTO:TYPE Design Competition. There was a three-way tie for the winning proposal, and two honourable mentions were also awarded. Recurring themes, the most popular being hybridization, stood out from the different submissions. These hybridizations were mostly characterized by the increase of programmatic diversity in the buildings, combining residential functions, office functions, various services, recreational functions, and commercial spaces. Another key element recurring in the various proposals were flexible spaces, as they enable spaces capable of adapting to changes in occupancy. Finally, several projects proposed a porous architecture in order to promote a better relationship between the buildings and their environment. If we consider typologies, the design competition displayed a extensive catalogue of solutions that can be linked to different contemporary experimental approaches in high-rise building development. Among the winners, the Folding Scraper project by Italian architects Stefania Papitto and Gianluca Evels is a formal and spatial fusion between the podium and tower types, merged together by a continuous surface bending and folding onto itself. 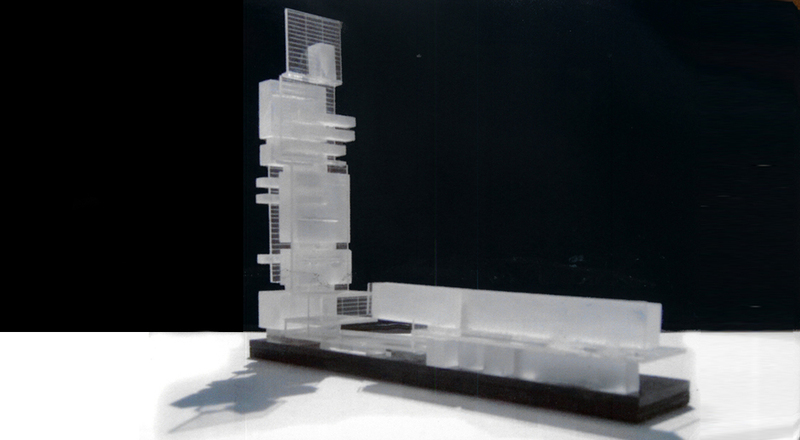 Distributed inside a structure of columns and cantilevered slabs, container boxes were part of the main spatial strategy as a way of providing numerous interstitial spaces for public activities. Along those lines, a team from Toronto imagined the construction of a high-rise building as a vertical strip, directly resulting of a perpendicular projection of the podium type, a tower which would span several city blocks. The third winning proposal by OTO, from Cleveland Heights, Ohio, addressed the tower type more specifically. OTO Open Tower proposed an alternative between POTO (Podium Tower) and COTO (Courtyard Tower). Thus, the Tower is opened, perforated, cut down and raised in order to allow a fluid relationship with urban life, environment, air and light. The Podium, with its public spaces and gardens, undulates and slides under the Tower. The honourable mentions were awarded to teams from Vancouver. Both proposed more radical typological solutions. Tony Wai and Christa Min's project, Stackhouse, was a reinterpretation of the “theorem”, first published in Life magazine in 1909 and used by Rem Koolhaas in Delirious New York. It is a tower comprised of open infrastructure, and surfaces, also called “generic fields”, which, overlapped, allowed a gradual accumulation of multiple self-standing projects. Lastly, “The Lost Typology: Rebuilding Diversity in the Shadow of Big Development” presents what could be perceived as biggest critique of “poto type” hegemony by proposing a completely different typology, based on buildings with mixed functions that addressed a more local approach at the scale of the block. Among the other submissions, there were also examples of “Inverted Towers”, “Green Towers”, “Twisted Towers”, and “Bridge Towers”. Some imaginative proposals were submitted, such as “Aerial Vancouver”, a floating megastructure recalling the technological utopias of the 1970s, and “Viral City”, an organic system of horizontal and vertical spatial sprawl able to contaminate the entire city. Others followed a new trend, that of landscape urbanism. The project “Vancouverism, Changing the Rules of the Game” wanted to transform the urban regulations that nurtured the development of Vancouver over the past decades to encourage an ecological reinvention of Vancouver's urban identity by putting the market forces at the service of the city. In this perspective, the “poto type” and any typological normalization effort are problematic. Bottom/up planning process, networking urbanism, local opportunity, genius loci, and diversity become the new vocabulary of urban planning. Very few design competitions in Canada have allowed the architectural community to address the design of extensive real estate developments the way that POTO:TYPE has. These projects are generally initiated and funded by private developers with little interest in submitting their projects to public debates and consultations. However, the design of residential towers, office buildings or a commercial complex often has a far greater influence on the urban landscape than the construction of museums, theatres or even a city hall. Contrarily to the latter, the repetition and proliferation of these ordinary typologies raise a key question regarding environmental quality and community welfare. As it happens, POTO:TYPE Design Competition originality lies in this taken opportunity to attract attention on these crucial issues in an encouraging political context. Potogroup and the Architecture Foundation of British Columbia present an open architectural ideas competition: poto: type. This competition will question the emerging typology originating in Vancouver's downtown area: podium/tower typology. The podium/tower typology evolved as a response to the cities' desire to intensify its downtown area by increasing the number of residential units while maintaining pedestrian-friendly streetscapes. Proliferation of this architectural mono-type could potentially create social and economic disparateness while weakening neighbourhood identities. Potogroup makes an invitation to the participants to explore, rethink, question and experiment with new ideas that will challenge the concept of the podium/tower. This investigation should encompass formal, programmatic, social and cultural aspects of this specific type. The projects should challenge the logic of the present, formulate new questions, and facilitate variations that will allow new potentials for living and existing in the city. Poto:type should investigate both macro and micro scale as well as examine the notion of vertical sprawl'. Architects, intern architects, designers and creative thinkers all around are encouraged to take part in this challenge to reinvent the ubiquitous Vancouver poto:type and explore viable alternatives for urban densification. The criterion is to explore alternate solutions to the mixed-use/residential typology currently prevalent in Vancouver, with a typical density of FSR 8, and a fictitious site of 120'x600' with a 300' ceiling and 4 storey street edge typical of a comprehensive development. It is the competitor's prerogative to depart from these criteria and propose a project outside these zoning bylaws, but should the entry wish to work within these parameters, competitors may look at the guidelines of the City of Vancouver Comprehensive Developments (CD-1). Regardless, all proposals should attempt to incorporate social, regional, economic, technical, and aesthetic elements into the final solution.